The Paris Agreement created the largest market for clean energy in history, according to Kerry, emphasizing that pricing carbon is now the single biggest step countries can take to send another signal to the market to cut their pollution. A recent report by the OECD, however, found that countries are still far away from adequately pricing carbon to slow the pace of climate change in line with the Paris Agreement goals. The gap between the real climate costs and actual carbon prices is currently a whopping 76.5%. This means that today’s carbon prices are still too low to have an impact on curbing climate change. This is the case even in the EU’s Emissions Trading System (ETS) where prices have risen to over €20 in the last weeks. California Governor Jerry Brown criticized the EU at the Global Climate Action Summit for ‘screwing up their carbon market by giving away too many allowances’. While measures were recently taken to reduce the oversupply of allowances in the EU ETS, around half of the total allowances will still be handed out for free to carbon-intensive industry. It is hence no surprise that the OECD report singled out industrial sectors, where the vast majority of emissions is still entirely un-priced. The incorrect pricing of carbon hampers the achievement of the Paris climate goals. “We are wasting an opportunity to steer our economies along a low-carbon growth path and losing precious time with every day that passes”, warned OECD Secretary-General Angel Gurria. Putting a price on pollution can have transformational impacts by making sustainable options affordable. This will require higher, more realistic pollution prices than we observe today, and no more free handouts to the biggest polluters in the form of free allocation. 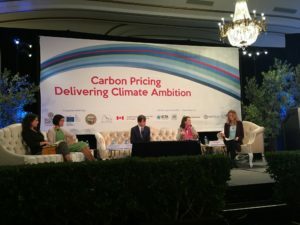 Revenues from carbon pricing moreover need to be re-invested in sustainable ways of transportation, housing, production and consumption, in order to enable citizens to make climate friendly choices. 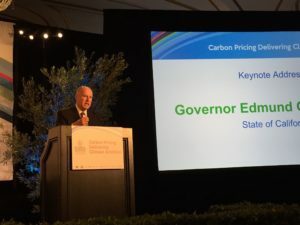 Governor Brown sees carbon pricing as a ‘critical’ element in a bigger set of policies, as it lowers emissions and encourages investments. But pricing policies are complicated and a lack of engaged NGOs hampers this potential. Without more engagement from environmental groups, there is a high risk that carbon pricing measures will stay ineffective, serving the biggest polluters rather than people and the atmosphere.